Made me think this is a good time to re-visit a post I did summer of 2015 where I began addressing the differences in Vogue re-issued vintage patterns and their original counterparts. Per the text I originally published in the Blogspot piece, '13 years ago, I documented my original Vogue Halter Gown pattern #9180 and being that it is a vintage pattern in public domain, I made reproductions of it available for purchase. Not long after, Vogue came out with the 'same' design in their Vintage Vogue series (now out of print). I say the Vogue re-issue is 'same' design as the original 1957 Vogue because, well it is the same-it has the same style lines, yet the lines of each piece between the two patterns are different. I refer to this as changing sight lines in patterns. 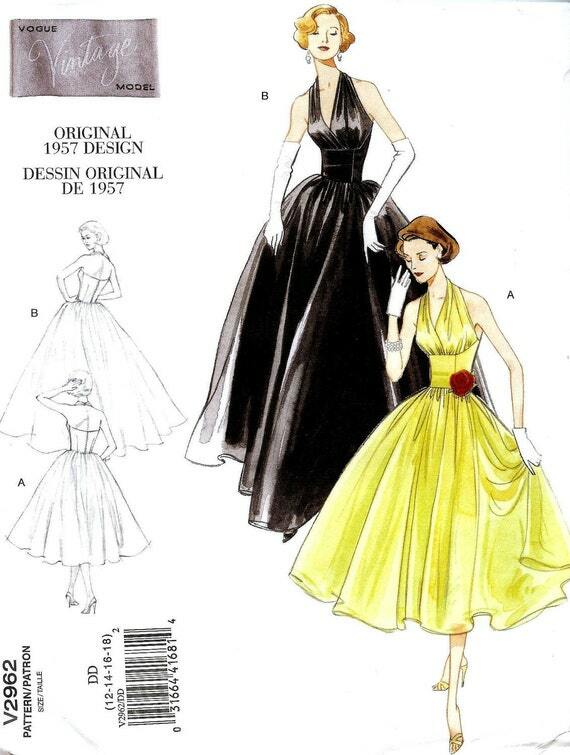 I had a couple other original Vintage Vogue patterns that Vogue also ran off in their series and I observed the same differences in pattern pieces as well. My photos demonstrate a printed draft of my original superimposed on Vogue's re-issue (I sold my original long ago-having no idea there would be an eventual study for which the tissue pattern would become handy) to reflect the differences in pattern piece shapes. I do not have the re-issued version in the 32" bust size, but a clear idea is had where the lines are very different despite the jump down in size when comparing. When looking at this exact trace from the vintage original to the re-issued pattern, there is more shaping in each piece; the original version was more tailored than Vogue's re-issue with one exception. Not only did pattern companies not renew copyright on many of what we now consider vintage patterns throughout their histories, they didn't even keep an archive of such patterns. In order to produce a vintage re-issue, the companies have relied on private owners to step forward with their vintage originals. I know some who have sent their original vintage patterns to Vogue from which Vogue made additions to their Vintage Vogue line, yet in doing so, I understand Vogue starts from square one when putting these patterns into production. They are not making use of the original pattern pieces in the way one would think for the fact that they are 'changing the sight lines' of the pattern to produce the vintage style. I will say the change in sight lines also have well to do with the fact that we do not wear the same foundations under garments as those worn at the time the pattern designs were originally circulated (what do we vintage sewers do? We produce foundations meant to be worn under the garments we produce from the vintage designs)! An EvaDress advantage = I don't discontinue patterns on the frequent basis that ANY of the Big Four do! That being the case, I want to know what interest there may be for me to make this into a multi-size pattern, so please write in or comment here!